This book summarizes the main integration strategies currently found in analytical instrumentation or laboratories, giving a wide and updated panorama of analytical chemistry. The objective of this book is to highlight the different integration solutions, currently used in analytical chemistry, by treating them in groups of one or several chapters. The book is aimed at graduate students and researchers in industry and academy to help them acquire a critical vision of some of the current tendencies in analytical chemistry. It is written by an international team of researchers active within the fields covered in the book. 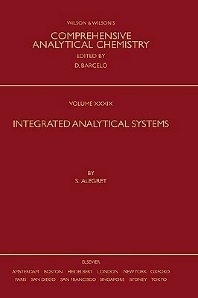 The authors come from a wide diversity of technological and scientific fields including: chemistry; electrochemistry; physics; materials science; microelectronics; electronic engineering; and the instrumentation industry, thus highlighting the multidisciplinary nature of analytical chemistry in today's world.